Longest. Post. Ever. My apologies–but it is necessary. The kitchen was the first major project we took on when we first moved in 3 years ago. 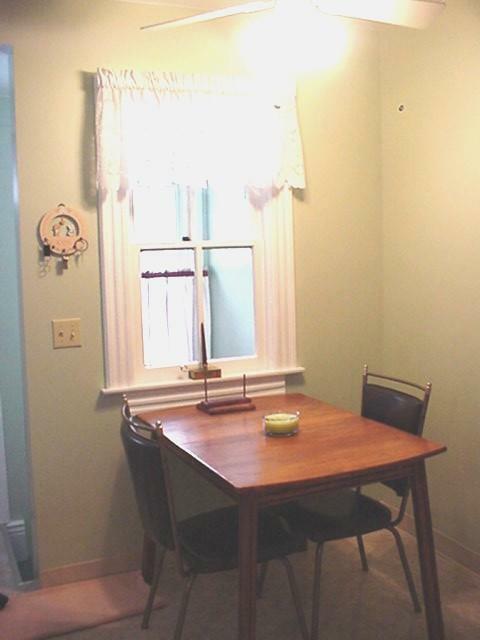 Much like my feeling about the before version of the bathroom, it was OK, but after refinishing the dining room and living room floors, the pinkish sheet vinyl was no longer doing it for me. More on the 1/2 bathroom here. Under the vinyl flooring was a layer of plywood and under that was a layer of old linoleum. Thankfully the linoleum was not glued directly to the floor. There was a layer of that red rosen paper stuff. All around the room was the weird plastic baseboard, which came out first, then the vinyl which came up in about 5 seconds. The problem came with the glue that was used to hold the vinyl down. It actually wasn’t holding it down at all, but it did make removing the 1 billion screws and nails extremely hard as the glue had settled into all the screw heads. We spend HOURS removing all the screws, and I was pretty worried about how the floor would look from all those screws. There were screws seriously every 4in, GAAHHHHHH! After the plywood was out the linoleum was removed and the hardwood was exposed. For the most part the flooring was in really good shape except for a few holes, water damage, and some thin spots. Pete’s took care of it shortly after. After much debate we decided to go with an oil-based finish. 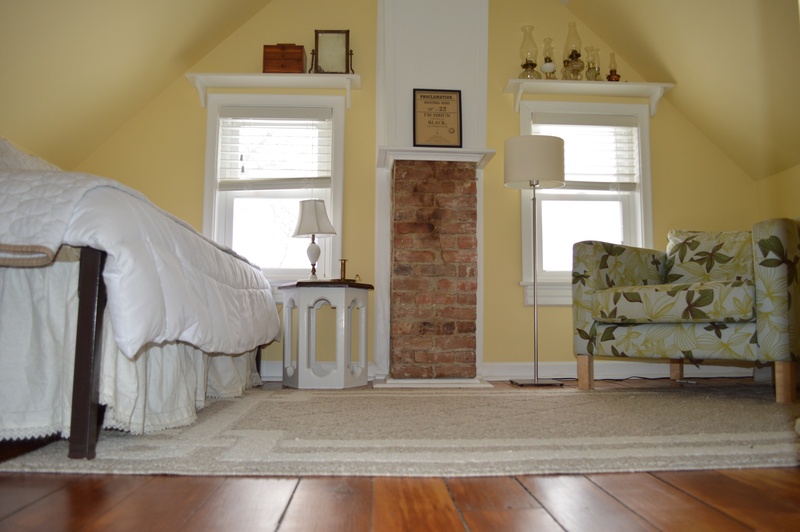 Smelly, yes, but it was more in keeping with the original finish on the floors. 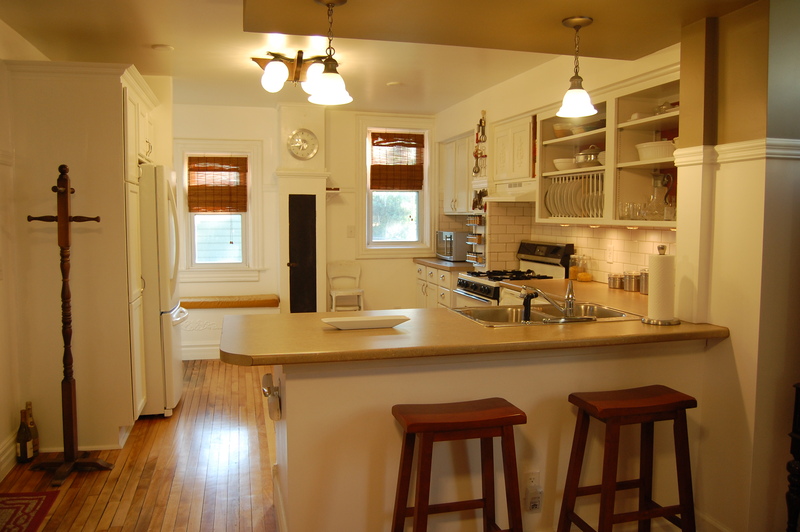 I love the size of the kitchen and the open feel, so when we were deciding how to make better use of the space and increase the storage, we decided against trying to plop an island in the middle of the kitchen. I have seen a lot of “flipped” houses online that are for sale and for some reason people keep trying to put an island in every kitchen without thinking about traffic flow and how many people are going to be working in the kitchen and so forth. 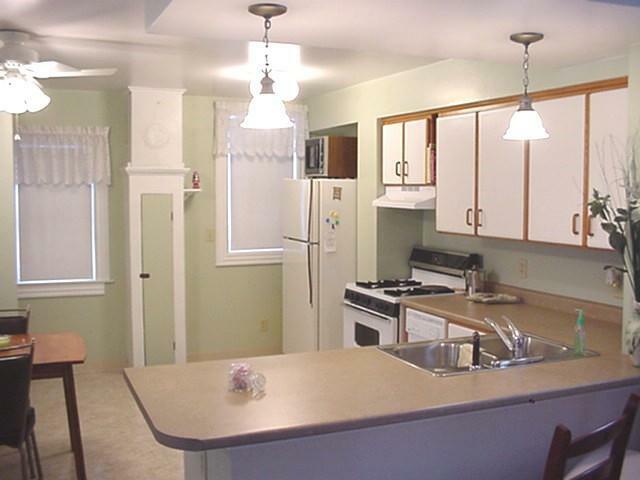 In the original photos you can see that there was no storage or cabinetry on the left side of the kitchen so we needed to do something. 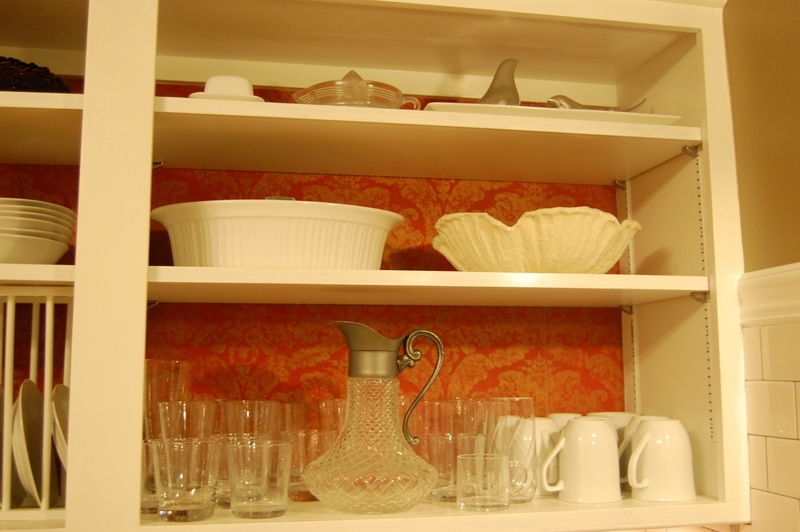 The 2 upper cabinets and the 4 lowers were not doing it for me. 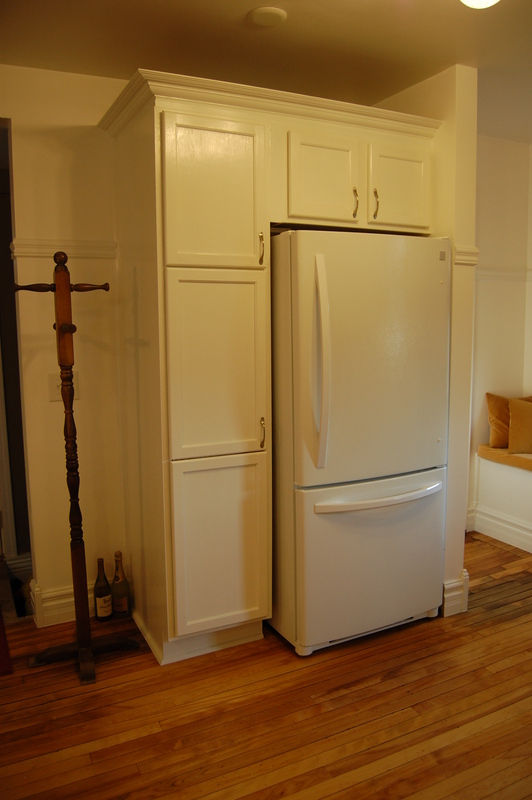 We decided to move the fridge, from its original location, across the room where the table is in the before photos. As you may have noticed, there is a window there. It may be deciving in the photos as that window does not actually look outside, but it looks down to the basement stairs–this suggests that the stairwell to the basement was added sometime after the house was built. I felt a little guilty taking the window down, but it just had to happen. We removed the window with the help of my dad, and I drywalled over the opening. We also upgraded the fridge with the help of the MN State appliance grant that happened a couple years ago. It was a grant for homeowners to replace old and inefficient appliances with newer energy efficient models. We decided not to go with a stainless steal fridge for a couple reasons–1) they are more expensive 2) the other appliances in the kitchen are already white and we don’t plan to upgrade them, and 3) the style of our house doesn’t really scream shiny and modern, and the white seems to fade away into the cabinetry nicely. We were able to save about 50% with the grant, plus picking a fridge that was 20% off at Sears. WOOT! In keeping with the built-in feel, we decided to enclose the fridge in cabinetry with a pantry on the left side and an over-the-fridge cabinet above. 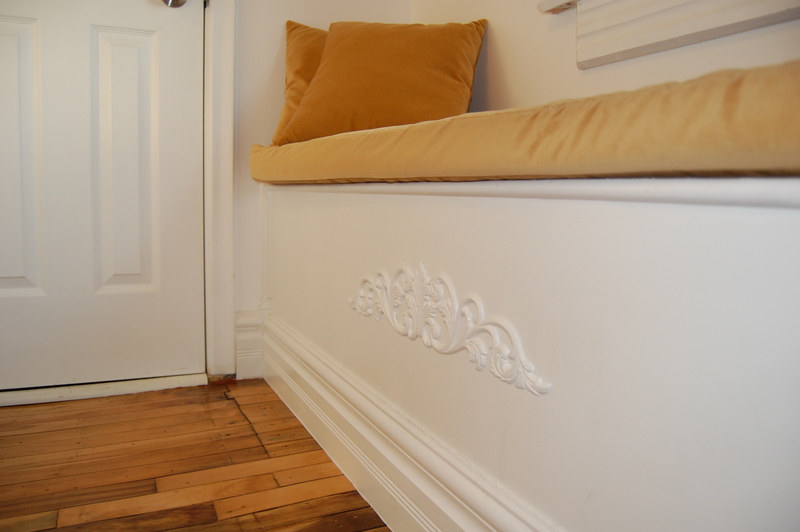 This is trimmed out with a thick crown molding. In place of where the fridge used to be we put in some base and wall cabinets that were purchased unfinished from Menards at 20% off. Luckily, I found a scrap piece of the exact same countertop that we already had in the clearnace section for $20, so I snagged that as well. We had to make a cut for it to fit perfectly. This countertop did not come with a backsplash which was fine with me, because I don’t like the look of them. I actually removed the backsplash piece from the other counter top to make it flat against the wall. I did this while Adrian was at work, and he expressed several concerns when he got home. Thankfully, I was able to get him on board with it. 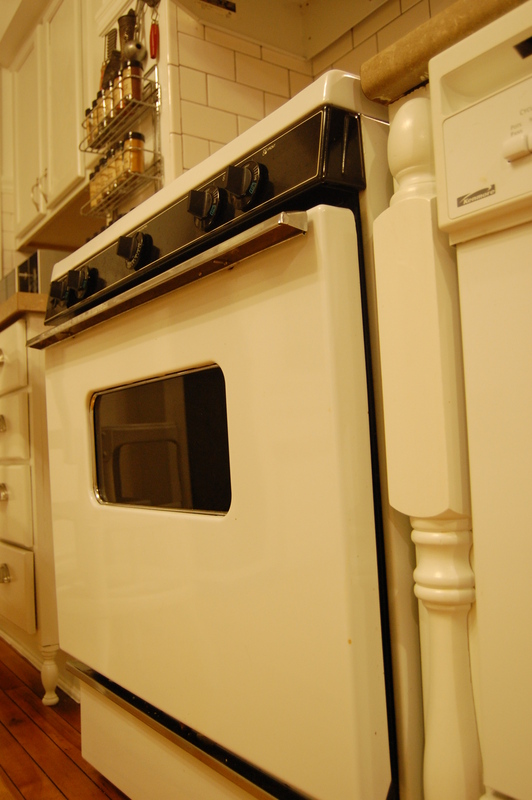 I was not a huge fan of the door style of the orginal cabinets, or the orangey stain of the cabinet faces so I painted them a high gloss white. I think it was the Dutch Boy Kitchen and Bath or something like that. This paint went on pretty easy and only required 1 coat of paint on the new cabinets, and 2 on the old ones. The cabinet doors were removed from the uppers and never put back on. I did have the backs of the cabinets painted a pretty turquise blue, but I decided that it didn’t really fit well with the style the house was going in and I replaced the blue with the red and gold damask wallpaper (the same paper that is in the 1/2 bathroom). The whole room got new toekicks, baseboards, 3/4 round, and a 60in chair rail. All nailed by hand (I really have no idea why we didn’t buy a decent nail gun years ago?!). 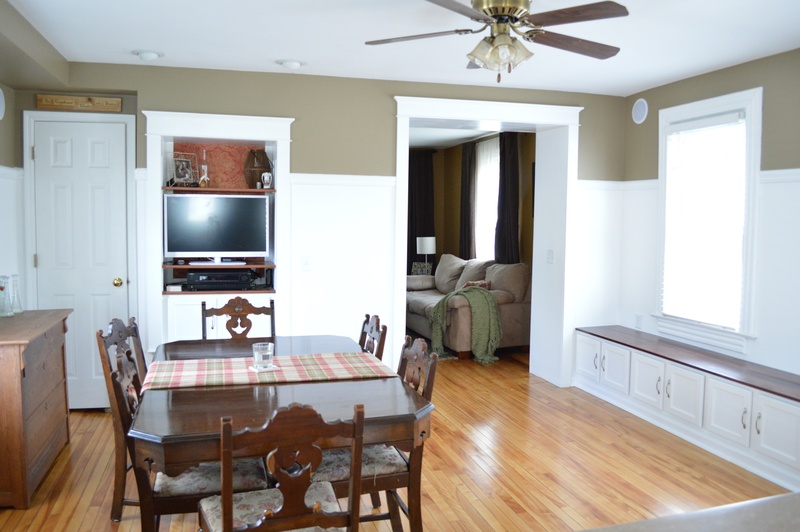 We also added some 1/2 spindles and spun legs to the cabinets to give them a furniture feel. 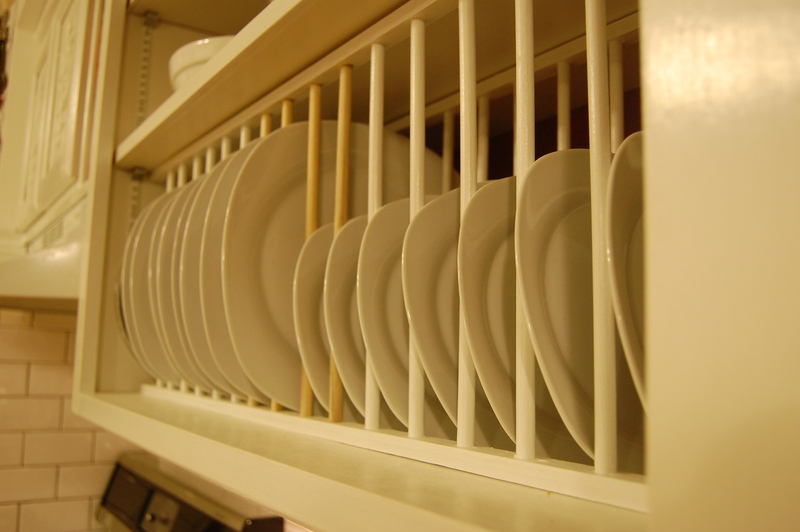 I also designed and made my own plate rack. You can find kits online or purchase from a cabnitry line for anywhere from $50 to $200 depending on the finish. I spent about $15 in materials to make mine. I bought 3/8in poplar dowels and spaced them apart according to the dishes. 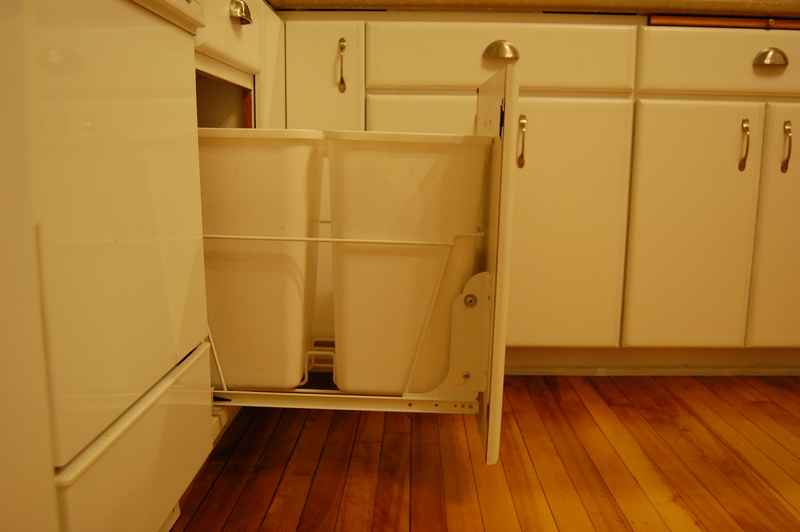 You dont want them to be too tight together that you have to scrap them in every time, but you don’t want them too far apart that the dishes have too much room and are too slanty. You can see that the small plates on the right don’t fit quite as nicely, but I wanted to stay consistant with the spacing all the way through. Adrian drilled the holes in the top and bottom base on each side and each base was then screwed into the cabinet. I painted mine by hand with a brush, but I would suggest using spray paint to simplify the process. 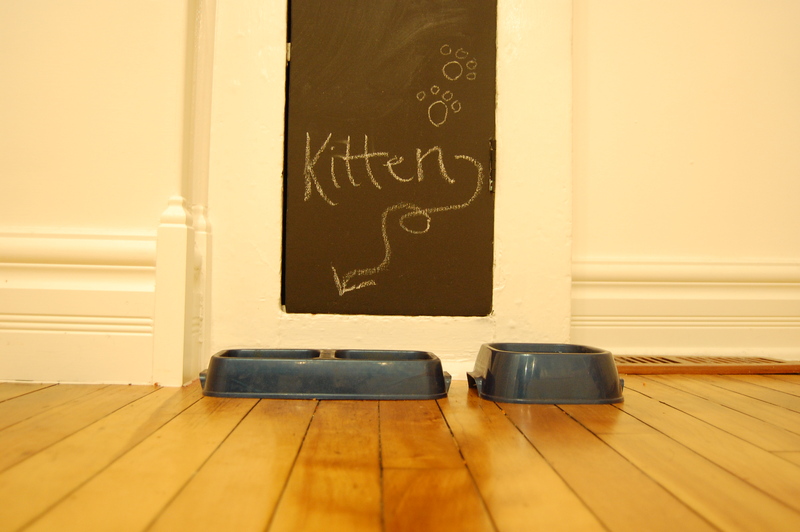 I rolled the door of the little stove cabinet with some black chalk board paint that I got on sale at Menards. It is Rustoleom brand. I think they also have it in green and pink. The walls are straight from the can Behr Ultra White from Home Depot in keeping with the light and bright feeling we were going for. 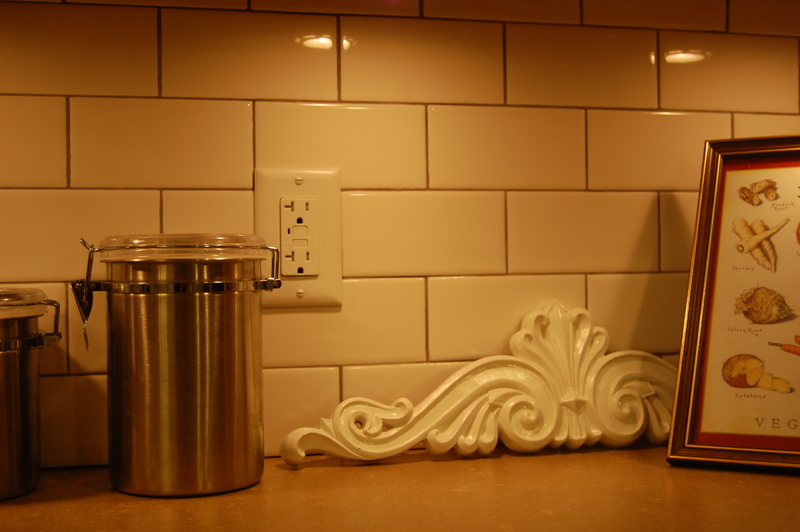 I wanted a traditional looking subway tile backsplash. It’s no surprise that we went with the white tile at Menards. It was the cheapest between Home Depot, Lowes, and the Tile Shop. It was also 20% off. Score. We picked a light grey grout. I was too afraid to go with a white grout because it thought it might be hard to keep clean and I wanted to be able to see the individual tiles instead of a wall of white blah. You would think that grey would make it look dirty, but it actually gives it an antique feel which is nice. We are very pleased with how it turned out. I love the tile, and I love the grout. Although a process, tiling was pretty easy. Adrian did all the cutting with a barrowed wet saw, and I did all the tile laying and grouting. We used tile mastic because it was going directly onto the existing drywall. If you are putting your tile onto cement board you must use thinset morter. 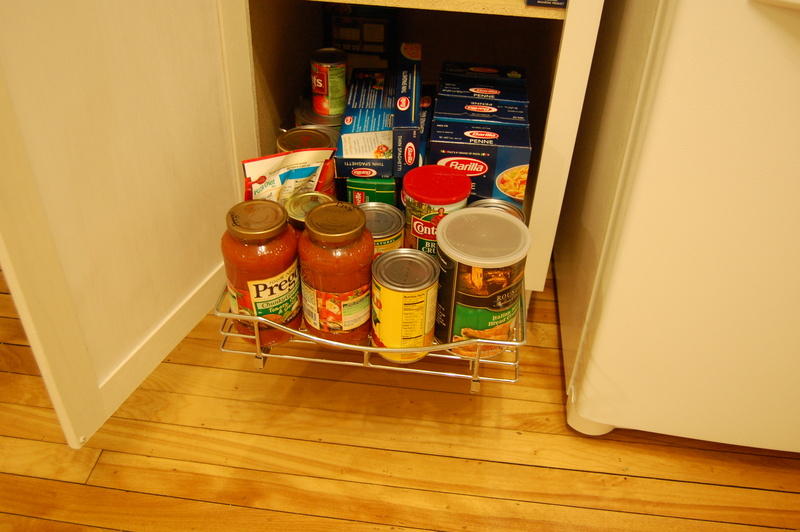 One nice little bonus that we included in cabinets were a few roll out trash/recycling cans, and some pantry roll outs. 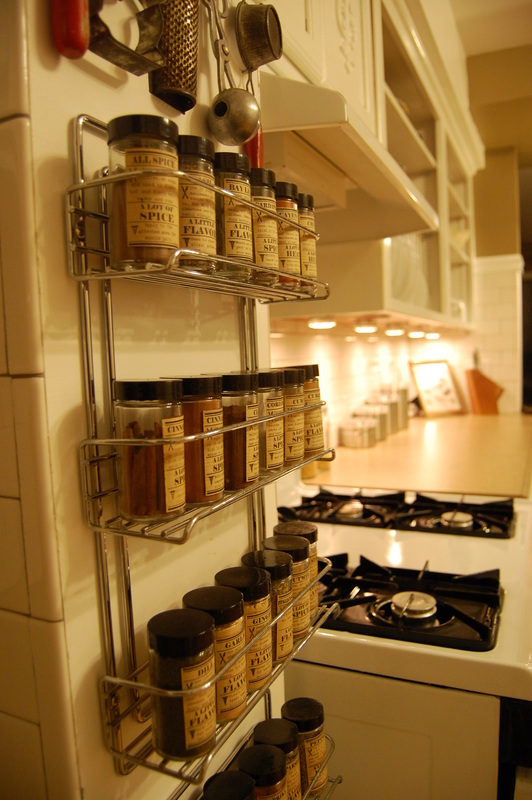 Little things like this really help maximize storage space and make using the space easier. The pantry roll outs were on clearance at Menards. They are Lynk brand, but I dont think they carry them anymore. The trash roll outs are rev-a-shelf brand. Both were easy to install and we are very pleased with them. 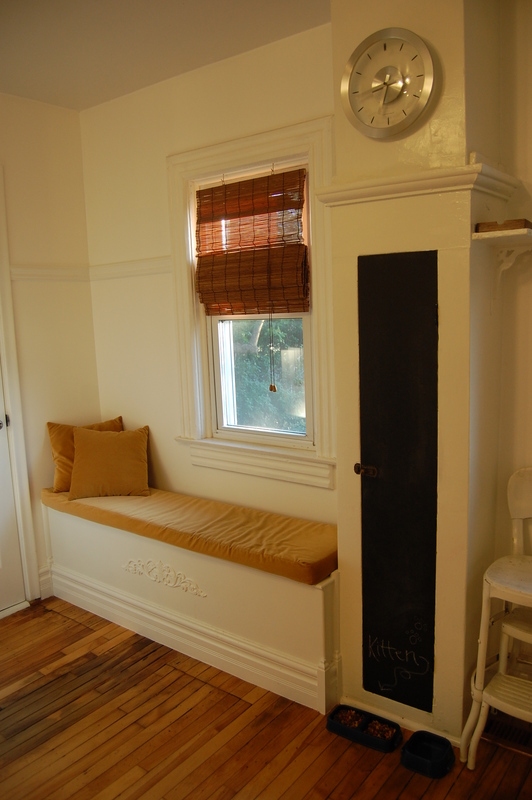 One of my favorite projects, and one that I had wanted to do since the day we moved in, was the window seat. It was very simple to make. Some 2x4s and wood screws made a box which we covered in 3/4in plywood that we had laying around. We screwed the frame to the floor and the wall before nailing on the plywood. 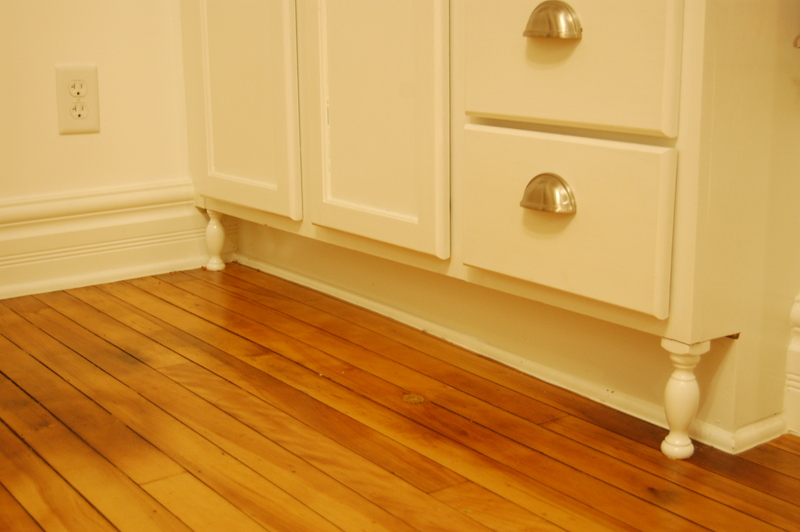 to really give it a builtin feel, I ran the baseboards along the bottom and trimmed the top with 3/4 round. Finally, I added a wood applique centered on the front. the cushion on top was made by mom and myself. I bought high density foam at Jo-Ann Fabrics for 40% off, wrapped the foam in quilt batting, and covered it with a gold velvet-type fabric from the clearance section for $3. My mom still comments about how difficult it was to make the cushion cover. Unfortunately we learned the hard way that the cushion was way to long to have a envelop style cover. If we did it again we would have made 2 separate cushions. Trying to roll that cover onto the cushion was a nightmare. My mother would say that sewing the corners was the worst part. the pillows took about 15min to make. After much debate we opted to go for xenon puck lights for the under cabinet lighting. It was easy to work with and gave off the look and color of light that we liked. They are actually supposed to last a really long time, second to LED. One con of the xenon lights are that they produce a fair amount of heat. LED was our second choice, but I wasn’t feeling the cold color it was giving it off and they were more expensive. I also waited until they went on sale. 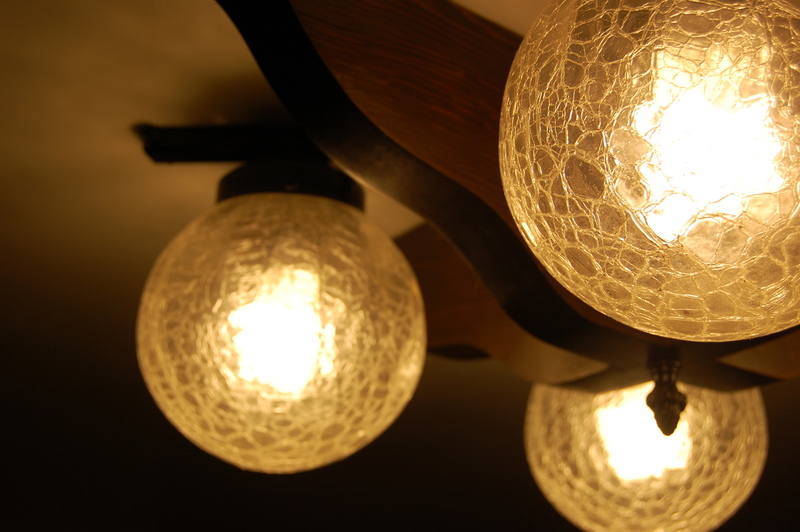 We decided not to hard-wire the lights, because it would have been a lot more work and we didn’t have too much know-how on it–plus im afraid of getting electrocuted as noted here. I’m not kidding when I say that there was a ceiling fan in almost every room in the house–craziness. When we moved the fridge there was not enough room to keep the ceiling fan. 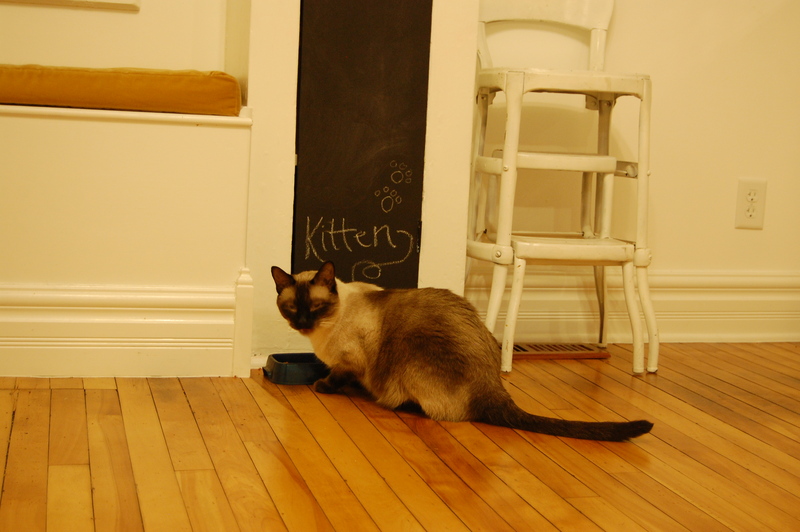 We paid an electrician to move the wires to the center of the room–if I did it again I would try doing this myself. We installed a fixture that we found on craigslist for $10. It came out of an old home and features this awesome crackled globes. LOVE. 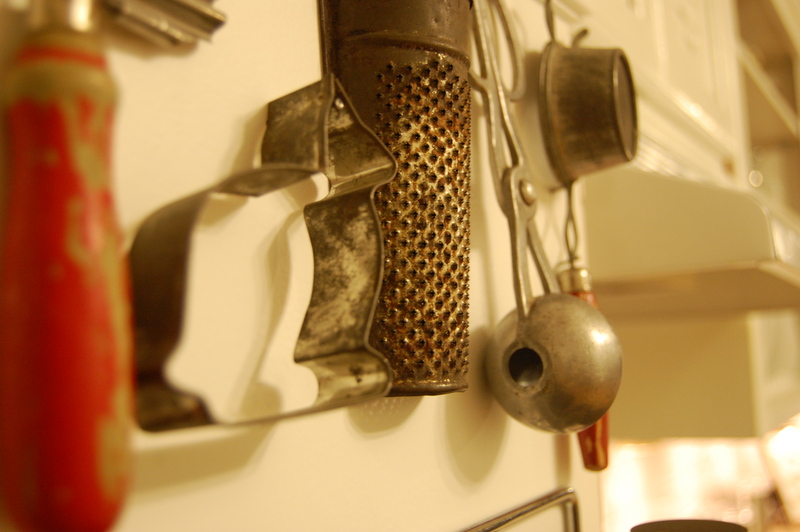 I have been collecting antique kitchen utensils since we first started working on the kitchen. We have found these all over the place for pretty cheap. My mom and I are planning on going to a couple flea markets where they are readily available for a good price. There is really no rhyme or reason to picking these. I just pick the ones that I like. 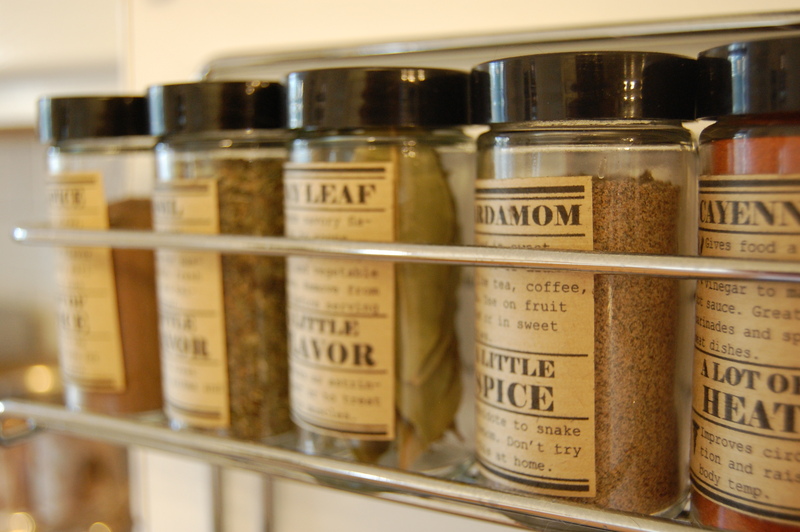 I made the labels for the spices with a little help from DIY Diva. 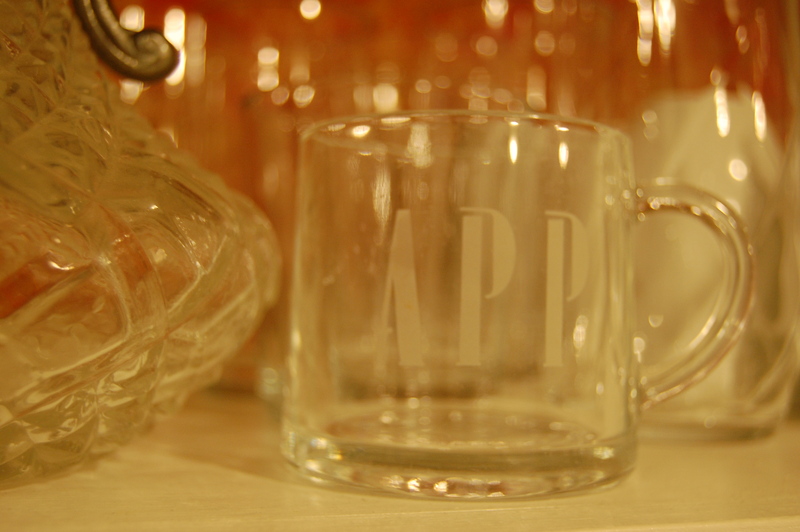 She made the layout for the labels and you can find them on her site. We did change a couple of them and added our own on photoshop as needed. I pretty much followed her instructions for making the labels, and I put them on spice jars that I found at Bed Bath and Beyond for $1 each. The racks were purchased on Amazon for $12 each, but it looks like the price went up now. I’m really happy with the way it turned out. 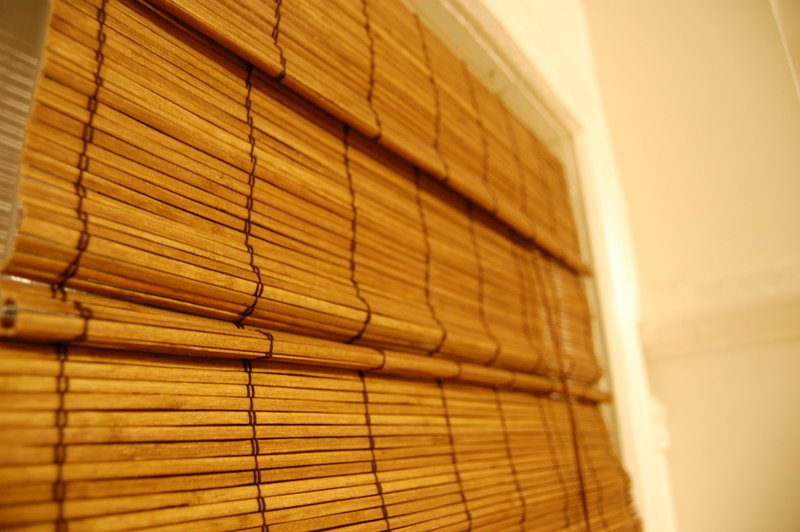 We opted to go with some woven bamboo blinds to give a little privacy but still let in some light. I love the look of them, but they are see-though, particularly at night, so don’t use these if that bothers you. I have seen people fashion linings to the back to help with privacy, but I have been reluctant to do so in fear of blocking all the light. All and all it probably took about 2 yrs to fully complete everything, but we completed work on it in stages and just when we felt like it or had a little extra time. We did a lot of work when I had breaks from school, such as over Christmas, spring break, or summer. I would say that it still isn’t completely done for good, but its pretty darn close. Anyone else attempting a kitchen update? 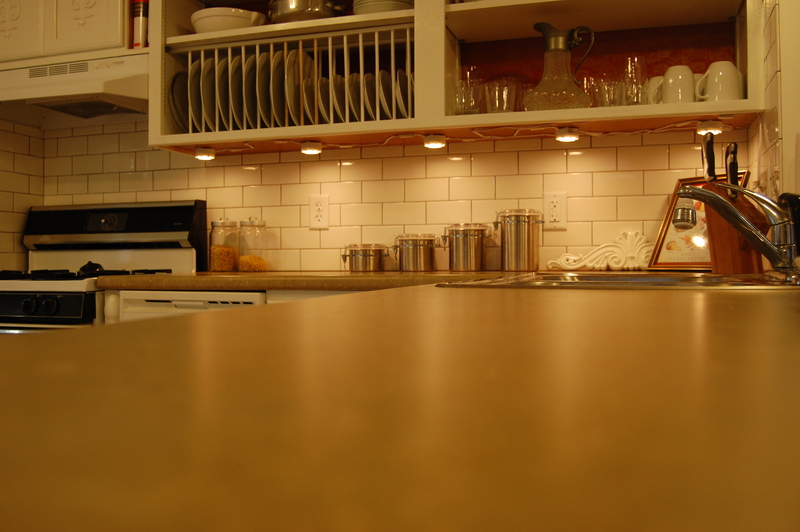 What kind of surfaces would you want in your kitchen? Sleek stainless steel or a rustic butcher block? How about a backsplash? 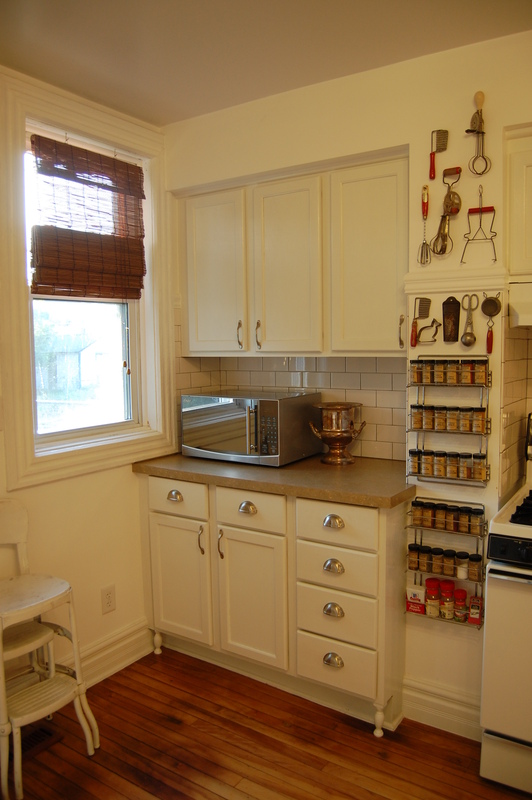 Were we crazy to go with the gray grout? Don’t be shy, shoot us a comment! So gorgeous! I like the interior design that you have shown of your kitchen. I am also looking to decorate my kitchen this way. 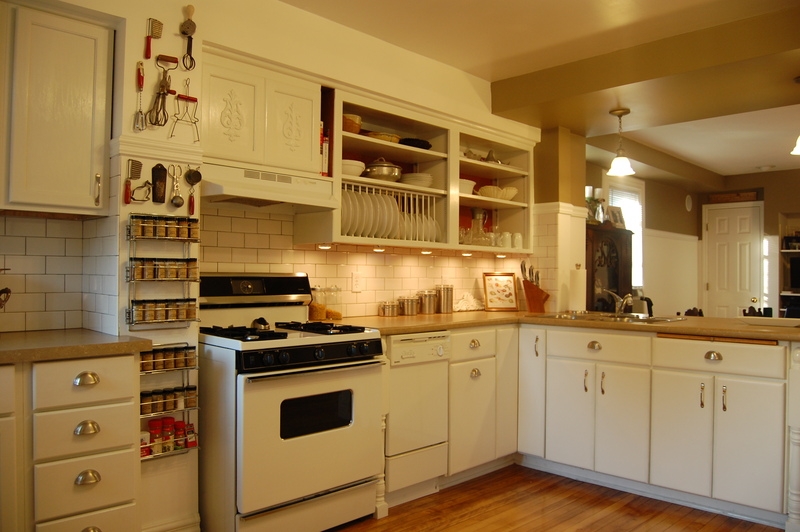 You have shared very wonderful ideas of kitchen decor. Thank you! It was really a labor of love. Glad I could give you a few ideas. I am super in love with this kitchen. Super. THIS IS INCREDIBLE. I’m so impressed by your work–it’s reall well done, thoughtful, creative and liveable. Inspiring. Hmm it appears like your site ate my first comment (it was extremely long) so I guess I’ll just sum it up what I wrote and say, I’m thoroughly enjoying your blog. I as well am an aspiring blog writer but I’m still new to everything. Do you have any tips and hints for rookie blog writers? I’d certainly appreciate it. I’m pretty new myself! I find that reading a lot of other popular blogs helps tremendously. You will find that you become drawn to various blogs for specific reasons (format, wording, photography, etc). Once you find what that is, you can use it as inspiration for how you want your blog to look and feel. Sorry, I didn’t reply sooner. Your comment was sent to my spam folder for some reason. Good luck on your blog! Thanks so much! It means a lot coming from a pro like you. Kitchens and baths are so much fun. I’m insanely jealous of your new digs. It is going to be so awesome to watch you transform that grand old place.